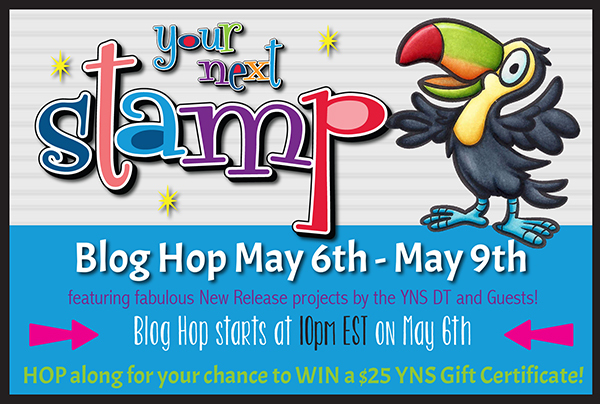 The time has come for the May release for Your Next Stamp! There is so much fun packed into this release that I sure hope you were able to take a peek today to see all the creativity the DT has put together. My first card I am showing is using the new Great Catch set. This is perfect for Father's Day or just for that fisherman in your life. I know I made this card with my FIL in mind using some of his favorite colors and this card will be sent for his birthday. For my second card, I am using the new set of Phoebe and Pets. This set is darling and I had a few ideas in mind. But the first one I wanted to do was this using the Mini Film Strip die. Positioning the strip where I wanted it, I then stamped the images within the frame to be colored in with Copics and then permanently adhering the strip to the cardstock. The main panel is over some patterned paper from EP, while the sentiment was stamped directly onto the main panel. I finished the look using some of the new shaped gumdrops to show a little love between these cuties! Don't forget that Karen has a fantastic deal that you will want to jump on! 20% OFF YOUR ENTIRE ORDER! Now you can purchase everything on your list at a great price. Thanks so much for hopping by and don't forget to leave a little love as you hop. 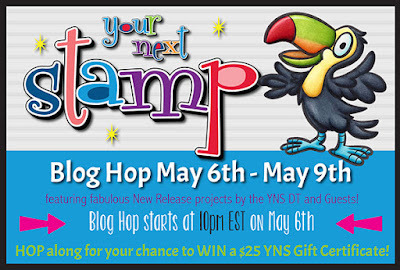 You will have a chance to win a $25 gift certificate to the YNS Store. Who doesn't want that?! Hope you all are having a great weekend! I love how you colored up Great Catch Deborah. So cute and love how you used the film strip with the little critters. i love your little guys in the film strip!!! I also like how you did up the bear in the extra square!!! great job!!! Awesome cards. Love the sweet images and your fantastic coloring. I can't stop looking at your 'best pals' card. Can I recreate this pretty please? Such cute sets this month! I like the film strip!! Your cards are just adorable! ! Great coloring on the first card. Love that film strip on the second. I love how you framed the critters with the film strip! Delightful cards. Like how you set the pets in the film strip. Thanks for sharing these on the blog hop. These are both just darling! Your coloring is wonderful! Wonderful cards! I think that the Great Catch set may be my new favorite! Thank you so much for the inspiration! everyone is doing such a wonderful job. I would love to buy all the new sets. I love how you used the film strip. Thanks for sharing. Both cards are so awesome! Your coloring is spot on & love the shadows in the water; perfection. And the film strip card is just THE sweetest! Love the image. Great job with the colouring. These are both super cute! Fabulous colors on that first one with that adorable image. Both these cards are adorable. I really love that little bear. The mini film strip die is great. Great cards Deb! Love that filmstrip!! Such wonderful cards! I love the colouring, especially in the first card. The second card is sweet and clean. Thanks for sharing! Love your cards! Thanks for sharing your creativity. Great cards. That bear is so cute! Very cute images and love the film strip die. beautiful inking/coloring on the first and looovvee the cute film strip one!